World’s Best Killzone 3 Player to Win a Share of $40,000. Is it you? We’ve been playing KZ3 online multiplayer here non-stop for the past 2 months, and the amount of trash talking in the office is at an all time high. That got us thinking…who is truly the best KZ3 player out there? Well, we’re all about to find out in a big way. 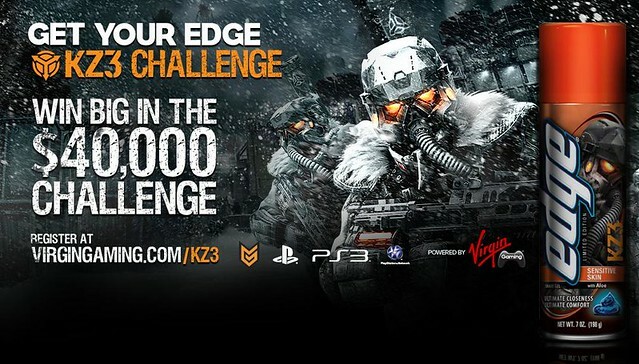 We’re very excited to announce the first ever KZ3 online tournament- the Get Your Edge KZ3 Challenge. PlayStation, Edge Shave Gel, and Virgin Gaming are looking to crown a champion, and we are offering up a $40,000 prize pool to find out who is the best of the best. This is a 3v3 tournament, so round up two of your best buds, sign up here (virgingaming.com/kz3) and start practicing. Click here to stay up to date on the latest tournament news and updates, including start dates and official rules. Would be nice to Win the money. Would eaither invest in a new car or put a down payment on a house. I wouldn’t know how well I would do under pressure gaming. No, it is not me. Kudos to whoever wins, though — heck of a windfall for playing a video game.